Currently, BHE uses capex for wind growth as the economics make sense given available subsidies. 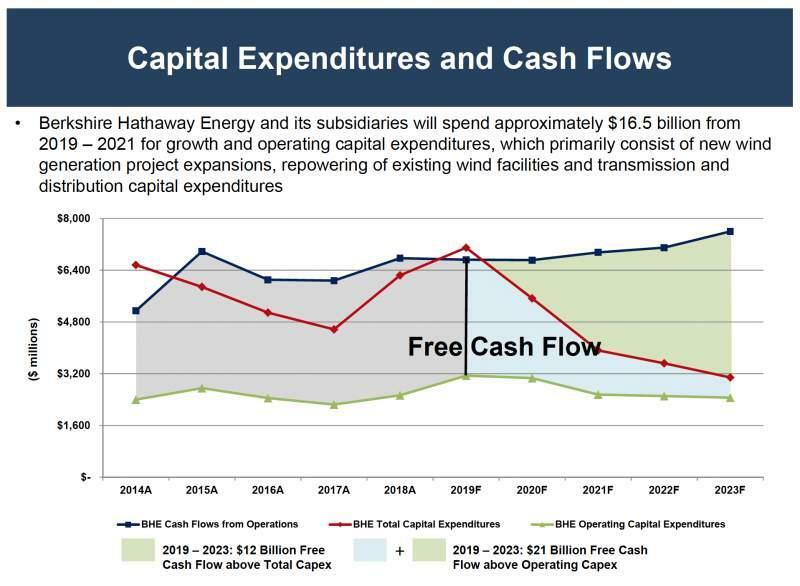 Capex for wind generation should decrease dramatically in 2021 which means unadjusted free cash flow will rise. Berkshire's tax appetite is a competitive advantage with respect to wind investments. A key subsidiary for the Berkshire Hathaway (BRK.A) (BRK.B) parent company is Berkshire Hathaway Energy or BHE. My thesis is that the unadjusted free cash flow for BHE will be substantial in the future. If current spending plans stay in place, then this will be especially notable starting in 2021. Presently, much of their capex is growth as opposed to operating/maintenance and this can obfuscate the underlying economics. Much of the investments are in wind generation growth and this spend is expected to decline in 2021. As we can see from the graph, the blue cash flow from operations line isn't much higher than the red total capital expenditures line up until 2021. Since unadjusted free cash flow is the former minus the latter, this means unadjusted fcf is not expected to be substantial until 2021. Adjusted free cash flow is different - we only subtract operating/maintenance capex from cash flow from operations. In other words, we subtract the green operating capex line from the blue cash flow from operations line to arrive at adjusted fcf. For the MidAmerican Energy segment, when I take earnings before interest and taxes and add back depreciation expense and subtract capex, the result is negative operating cash flow. When I repeat that exercise for each of the past five years, in its best year the segment generates $308 million of operating cash flow. When I divide that by tangible assets, the result is a return on tangible assets of 0.86 percent. Why are we allocating capital to a business that in its best year generates a return on tangible assets of less than 1 percent? As the shareholder said, page 64 of the 2013 annual report from the parent company shows that $1,806 million earnings before taxes plus $1,577 million depreciation minus $4,307 million capex is a negative number for BHE. I believe the $1,806 million is after interest as opposed to before interest, but the point I'm trying to make here involves capex. Much of that capex number is growth or "added capital investment." As such, adjusted fcf where we don't subtract growth capex tells us more about the underlying economics than unadjusted fcf. You were doing great until you got to return on tangible assets. The - we love the math that you just described, as long as we are going to get returns on the added capital investment. And we are in businesses, whether it's wind energy in Iowa or whether with PacifiCorp after we bought it, there were lots of opportunities for capital investment. And the energy which we bought, we're looking forward to putting more capital in because as long as we get treated fairly by the regulators in the states that we operate, we will get appropriate returns on that. And the return is not measured by the cash minus the increased capital investment we're making. It's measured by the operating earnings after depreciation. And there will be times in our businesses where no net investment may be required. But we actually prefer the ones where net - in the utility business - where net investment is required because we like the idea of getting more capital out at reasonable returns. The "added capital investment" part of the answer above is key. But if you compute net cash generated from those, you will see nominal or negative figures for a considerable period as we add to our investment and we make those utilities even more useful for people in those jurisdictions. I think we'll get a fair return. Generally when we look at our utilities, we do pay attention to our capital, we try to keep it very close to our depreciation. That's what we put back into the business. We'll even earn on that capital, but the reality is the lion's share of our capital right now is growth capital. And we earn a very nice return on that. I don't have the figures, but I would guess that perhaps 80 percent of the utilities in the United States cannot reap the full tax benefits, or maybe any tax benefits, from doing the things that we just talked about because they don't pay any federal income taxes. They've used bonus depreciation, which was enacted last year and where you get 100 percent write-off in the first year. They wipe out their taxable income. And if they've wiped out their taxable income through such things as bonus depreciation, they do not - they cannot - have any appetite for wind projects where they get a tax credit or - in the solar arrangement. The 2018 10-K says BHE repurchased 447,712 shares of common stock for $293 million in February 2019. That comes to $654.44 per share. 76,549,232 shares were outstanding as of February 21, 2019, implying a market cap of $50 billion. The 10-K goes on to say that the parent Berkshire owns 90.9% of the common stock which is $45.5 billion of the market cap. I think Berkshire shareholders are in good shape with respect to the wind investments that are a major part of the BHE capex. Wind generation isn't a panacea for our energy issues - the wind doesn't always blow and the economics don't work without subsidies. 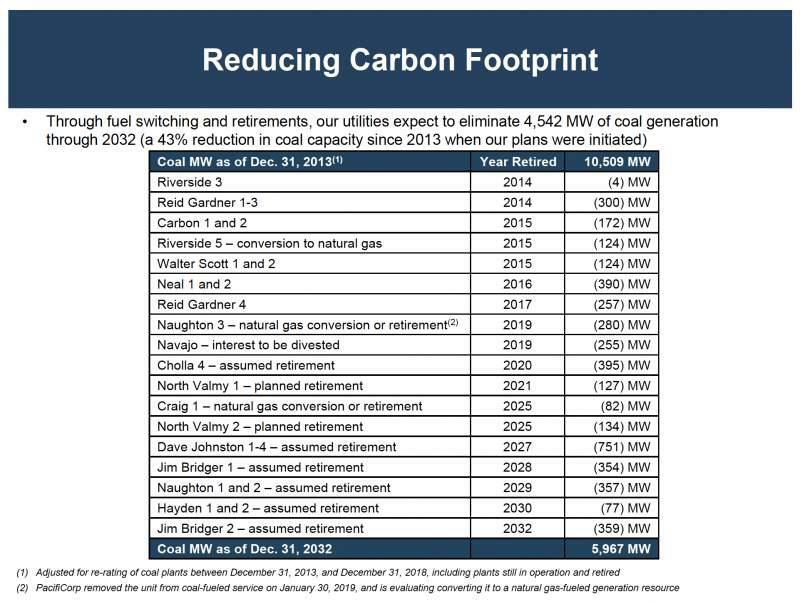 Still, Berkshire should get a satisfactory return on the growth capex investments in wind generation. Disclaimer: Any material in this article should not be relied on as a formal investment recommendation. Never buy a stock without doing your own thorough research. Disclosure: I am/we are long BRK.A, BRK.B, VOO. I wrote this article myself, and it expresses my own opinions. I am not receiving compensation for it (other than from Seeking Alpha). I have no business relationship with any company whose stock is mentioned in this article.